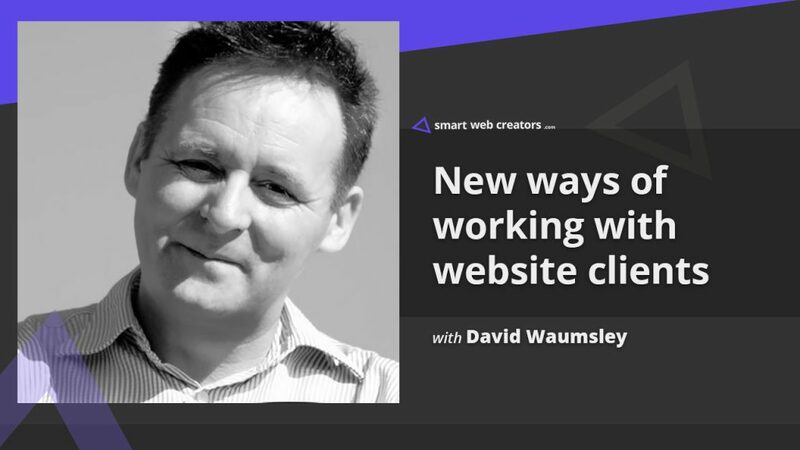 David Waumsley talks about new ways of working with website clients with Davinder Singh Kainth. He shares a different approach of working with clients for building websites. He is experimenting with “Book a Day” service where a client books a specific day for getting his website designed and developed. Do you work with other web agencies or direct clients for the website work. How do you price your website work, is it per hour or fixed weekly hours or per project or task estimate. Is this all white label work, that means you cannot display it in your public portfolio. Besides davidwaumsley.com website, what is the story behind your new “WP Cornershop” brand as a web front for offering website building services. At a price tag of 300 pounds a day (which is around 390 USD), how many days does a simple 5 pages brochure website would take. What kind of preparation work you do with a client before “that booked day” arrives. What happens during that day, like do you sit with a client in person or on a video call and then build a website. How much has been the conversion rate for your website clients opting for the care plan as against not opting for it. Your monthly care plans pricing is on the lower side, is there specific reasoning for the low pricing and are such prices sustainable. Which tools and services do you use to manage client websites on the care plan. What are your views on fixed pricing for website projects as against value pricing based on the client’s value proposition from the website in question. A lot of people in the online world teach and emphasis on the concept of value pricing. But, when you are working on the lower end of website projects like less than $6K – does value pricing has any value there. Exploring more new ways of engaging with website clients during website build process like live training or courses baked with live training. One way is getting into turnkey solutions (multisite), live courses for clients like 2 weeks course, one to one time, live videos in a group. He is a digital nomad who builds and contributes to Beaver Builder. He started using WordPress as a hobby and quit his full-time job to move to India with his wife. He now runs his business remotely using WordPress and Beaver Builder. David is a big contributor to the Beaver Builder community, has a personal site at David Waumsley, and is working on a project called WP Corner Shop. I’m having to listen to this in sections due to not enough hours in the day (ever! ), but loving it so far. Hearing about David’s background is really interesting too. Thanks! Diane, glad you are liking this. David is amazing !